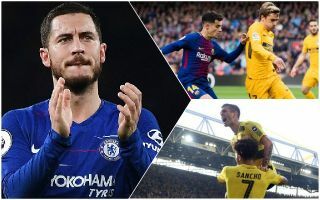 The Eden Hazard to Real Madrid transfer saga just won’t go away for Chelsea, with more bad news on that front today. As re-reported by Sport, Spanish TV show El Chiringuito claims Hazard has agreed a contract with Real Madrid. This follows months of speculation surrounding the Belgium international, who has, tellingly, still not signed a new contract with the Blues as he edges ever closer to it expiring at the end of next season. A player whose name is everywhere at the moment after a tough time at Barcelona, Don Balon have claimed Philippe Coutinho is a target for the likes of Chelsea and Manchester United, and that he may be available for around £92million. The Brazil international seems an ideal like-for-like replacement for Hazard, with his skill, intelligence and eye for goal from an attacking midfield role on the left making him a very similar kind of threat in attack. That said, he’d be expensive and seems very much the kind of big-money buy Man Utd might make these days, particularly with the Red Devils in need of an upgrade on flop signing Alexis Sanchez. One of the best forwards in world football, it’s surprising not to see more rumoured interest in Atletico Madrid star Antoine Griezmann. The France international can play a variety of attacking positions and could be an ideal option for Chelsea to explore if they lose Hazard. That said, he’d probably be one of the more expensive options out there, so might be a tad ambitious for the Blues. Not so long ago the Telegraph linked Nabil Fekir as a transfer target for Chelsea, stating he could come in in attacking midfield, with Hazard moving up front. With that in mind, it could make sense for the Lyon star to come in as a direct replacement for Hazard on that side of the pitch instead. One of the top players in Ligue 1, Fekir seems ready to make the step up to a bigger club and more competitive league.